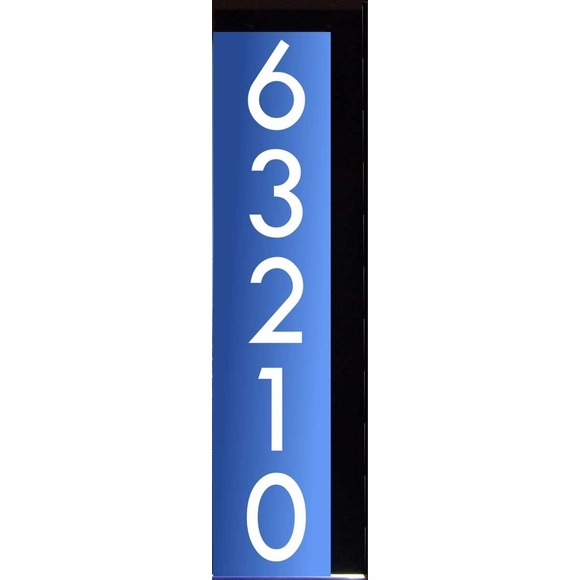 Vertical LED Lighted Address Sign for Wall, Post, or Mailbox - - holds a house number with up to five digits made in America. Unique 3D lighted signs help emergency responders, delivery drivers, and visitors easily find your home day or night. Weatherproof materials and long-life LED lights provide many years of service. Features super-bright lighting at night and impressively visible numbers during the day. Holds up to five (5) 2-1/2" characters or up to four (4) 3-3/16" high characters. Your house number and street name are printed onto a clear acrylic plate. Custom made with the lens color, font, and power option you choose along with your house number. Five font options (click second small image): twcent, century 751, poor richard, brushed script, and vonique. ABS plastic top, acrylic lens, ABS composite backing, and stainless steel screws. Dimensions: 4.5"W x 16.5"H x 1"D.
Vertical address number shown in large image above: 63210. Small customer submitted image first from right above shows the edge that contains the light; since it's edge lit the side and bottom are not trimmed like the top and other side.